Our processes are simplified with AWS, which is giving us big savings on IT maintenance. In addition, our infrastructure costs are massively reduced. We estimate that together these two factors will save us nearly $500,000 over the next five years. With 600 consultants worldwide, msg global solutions is a leading international IT partner for the insurance and banking industries. The firm, with headquarters in Regensdorf, Switzerland, was founded in 2008 and has 18 companies across 14 countries. Through its Nexontis Consulting subsidiary, it offers SAP-based solutions to help insurers gain greater access to data and meet regulatory compliance, including IFRS 4 and Solvency II requirements. There were additional challenges for the firm, such as controlling costs, avoiding investments in new hardware, an allocating costs to the appropriate business units for accurate reporting. To improve services, msg knew it had to look beyond its existing on-premises infrastructure. “Searching for a way to enhance our processes and speed up the delivery of services, we investigated the biggest cloud infrastructure provider in the world—Amazon Web Services,” says Jankovic. A key factor for msg was finding a provider that could deliver reliable performance and availability worldwide. It also needed a provider that could offer a fully SAP-certified HANA environment on a public cloud platform. Amazon Web Services (AWS) fit the bill. msg now runs the SAP for Insurance solutions, powered by SAP HANA, on multiple AWS instance types for both the SAP applications and HANA database layers. It is currently using 40 Amazon Elastic Compute Cloud (Amazon EC2) instances. These instance types provide internal users and msg customers with access to its demo consulting cloud, PoCs, and training systems. The company uses Amazon Virtual Private Cloud (Amazon VPC) to connect to the msg global datacenter, giving the firm’s employees direct access to SAP systems. Amazon Simple Storage Service (Amazon S3) is used for data backups, including backup of the HANA database. 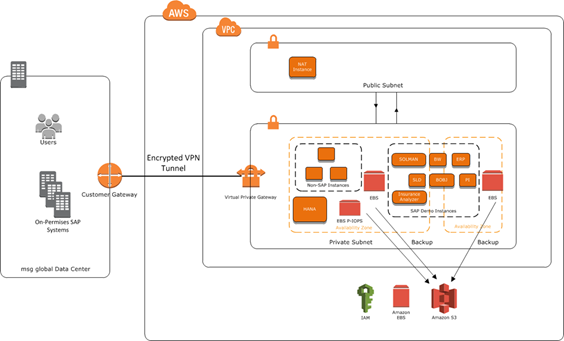 Amazon Elastic Block Store (Amazon EBS) Provisioned IOPS (P-IOPS) volumes are used for storage, while AWS Identity and Access Management (IAM) helps msg manage users and authorizations. “We’re also testing AWS WorkSpaces so we can provide our customers and internal users with secure desktops for accessing various SAP systems within Amazon VPC,” says Jankovic. For high availability, msg global leverages multiple AWS Availability Zones (AZs) without the additional cost of maintaining a separate datacenter. An additional benefit is that it’s now easy to allocate costs to the owners of the infrastructure. “It’s less of a management burden to control and report on infrastructure costs, which is also saving time for our staff,” says Jankovic. To learn more about how AWS can help your company run business applications, visit our business applications details page.